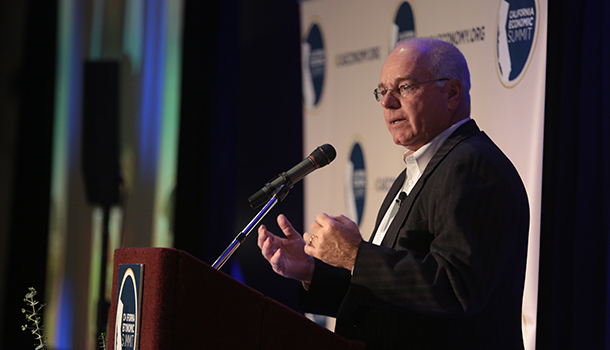 Lenny Mendonca, chief economic and business advisor for Governor Newsom, speaking at the 2018 California Economic Summit in Santa Rosa (Photo: Will Bucquoy/CAFwd). Those words are from Lenny Mendonca—the new chief economic and business advisor for Governor Newsom—who reviewed an ambitious economic agenda for the California Forward Leadership Council and the co-chairs of the California Stewardship Network on Thursday. “Our approach to economic development is not going to be from Sacramento down, but the ideas and approaches will come from the regions of California,” Mendonca said. The Economic Summit is the only organization in the state working on a regions-based, triple bottom line approach to economic development that will simultaneously advance economic growth, ensure environmental quality, and provide opportunity for all. CA Fwd and the Economic Summit have taken an indepth look at Newsom's proposed budget and shown the important areas of alignment. Mendonca emphasized the Governor’s recent review of his state budget has an eye on California's big challenges and outlined the priorities. “First, we are going to be disciplined on budget resiliency,” he said. The Governor’s budget includes plans to build up budget reserves, pay down debt, and make strategic one-time investments in helping economic priorities. “Housing is a major priority—and everything is on the table,” Mendonca said, referring to what Governor Newsom has called “The Marshall Plan” to address a 3.5 million housing unit gap that the state and local communities must address. The Governor has committed $500 million to start to address the policy tension that must reconciled in order to make a difference. “The Governor’s cradle-to-career initiative include increasing investments in the Earned Income Tax Credit for poor families and in early pre-kindergarten investments in addition to increasing funding in the K-12 system and post-secondary education,” added Mendonca. For California to sustain its often-quoted standing as the fifth largest economy in the world—our workers will have to be better trained. He pointed out that the Governor has an ambitious goal of increasing apprenticeships by nearly 700 percent from the current (and rather paltry) number of 75,000 active apprenticeships to 500,000 (Here’s a recent article on a successful apprenticeship program in northern Los Angeles County). Mendonca believes some of the newly-developed economic development tools like Enhanced Infrastructure Financing Districts (something the Summit actively promoted) are attractive but underutilized tools that can help deliver both economic results and have social benefits. “How do we fully utilize tools like the EIFDs and Opportunity Zones that can create returns for investors while also having social impact?” he asked, noting that these are two areas that the Summit and CA Fwd have been addressing. Mendonca added that parts of California that have not participated in the state’s recent economic expansion will get “disproportionate” attention. Rural California, the Central Valley and the Inland Empire were all named as areas where millions of Californians have simply not participated in the economic expansion the way many along the coast have. “That means ensuring the California works for all Californians, not just for those who are from certain zip codes,” he emphasized. The California Economic Summit and its network of regional and state leaders have been working on these issues since 2012 and look forward to accelerating progress. “The Summit’s ability to connect regional and state leaders to develop a shared agenda to generate jobs and improve regional competitiveness can provide value for the Newsom Administration and we look forward to helping advance our common goals with them,” said Jim Mayer, president and CEO of CA Fwd. Californians know that the time to fix our state’s economy is now. People from every region are standing up and demanding change. We must create real and intelligent remedies that will attract capital, generate jobs and encourage sustainable, resilient communities all over California. The Newsom Administration knows it and is ready to act. The Summit is ready to help.